Truth by Kbaig: Increasing Restlessness of Sikh Soldiers and Army Officers in Indian Army! 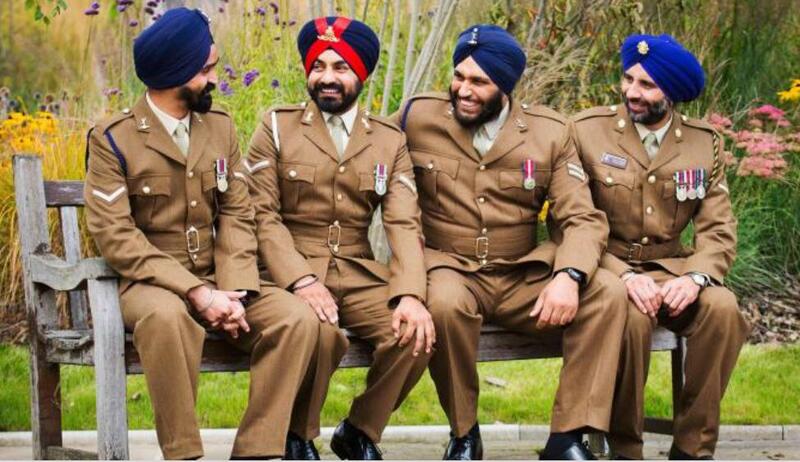 Increasing Restlessness of Sikh Soldiers and Army Officers in Indian Army! Sikhs started freedom movement for their Free Land consisting of Eastern Punjab of India in 1950. 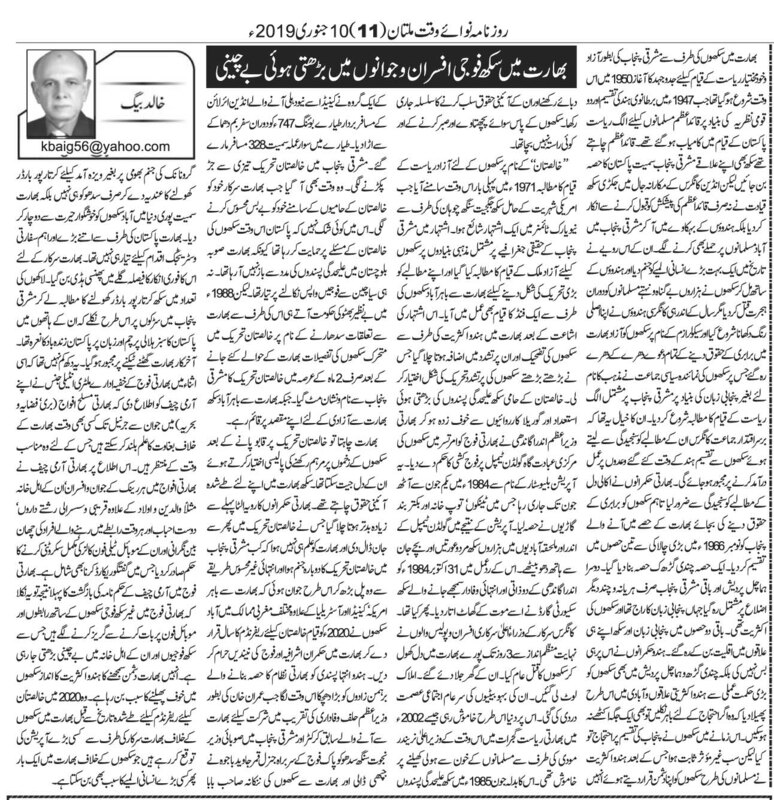 In 1947 Muslim succeeded in procuring a separate country under the leadership of Quaid Azam. Quaid invited Sikhs to join Pakistan with their Eastern Punjab, however, Sikhs supported Hindus rejecting the offer of Quaid. Sikhs massacred Muslims along with Hindus in Eastern Punjab creating tragedy in the history of sub-continent. However, Sikhs soon learned that they have been cheated and betrayed by the Congress in the name of equal rights for Sikhs in Hindu India. On realizing the fact, Sikhs started freedom movement based on their language i.e. Punjabi rather than religion. They believed that the Hindu Congress will fulfill its promises made to the Sikhs and accept their demand. Indian rulers took the demands of Akali Dal seriously, however, in spite of giving equal rights to the Sikhs, they divided Eastern Punjab into 3 parts in 1966. One part was made the part of Chandigarh and the third part consisting of Haryana and other few districts was left as the Eastern Punjab where there was the majority of Punjabi speakers especially Sikhs. In the other two parts, Sikhs were converted into minorities in their own areas. Not only this, Hindu leaders shifted Sikhs into Hindu majority areas in Chandi Garh and Himachal Pradesh in such a way that if Sikhs want to protest they cannot gather in one place. Sikhs protested over the division of Punjab but it was useless. After these protests, Hindu extremists declared Sikhs their enemies as well, just like Muslims. The rights of Sikhs were usurped and they were suppressed. Sikhs have nothing else except to bear the brunt of supporting Hindus in 1947. The demand of a separate land namely, Khalistan was first of all given by a Sikh Jagjit Singh having American nationality in 1971 in his ad published in New York Times. In the ad, the actual areas of Eastern Punjab were demanded to be freed on the basis of Sikhism; a fund was established to support the Khalistan freedom by the Sikhs living outside India. After this ad, the hatred of Hindus against Sikhs increased as well as the crimes against Sikhs. 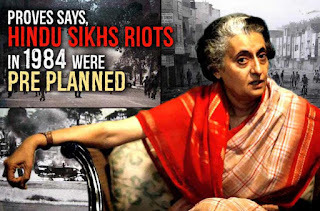 When Sikh reacted against the barbarism of Hindus in the form of an armed freedom movement, Indira Gandhi afraid of the increasing capability of Sikh Guerillas ordered Indian Army to attack the Golden Temple in Amritsar, a religious place of Sikhs. This operation code named as Operation Blue Star continued from 01 June to 08 June 1984. Indian army attacked Sikhs religious place with the tanks, APCs and Artillery. As a result of the use of heavy weapons by the Hindu army, uncounted numbers of Sikhs including children and women living in the vicinity of the Golden Temple lost their lives. As a reaction to Indira's atrocities against Sikhs, two Sikh bodyguards of Indira shot her dead on 31st October 1984. After this, Hindu members of Congress, officers, Police, army, and extremists massacred Sikhs for 3 days. Their houses were burnt, properties were looted, women were gang-raped. World remain silent over the Hindu terrorism against Sikhs as it remained silent over the genocide of Muslims in 2002 by Narendra Modi. In order to take revenge of the crimes of Hindu terrorists against Sikhs, Sikh freedom fighters blew up the Boeing 747 of Indian Airlines on June 1985 with the bomb along with 328 personnel coming from Canada to New Delhi. Once again the Khalistan movement spread rapidly in Eastern Punjab. Indian govt. became powerless in front of Khalistan Freedom Fighters. There is no doubt that Pakistan supported the Khalistan because India was involved in armed interference in Balochistan and engaged in a war over Siachen. In 1988, Benazir Bhutto came into power and handed over all the details of Sikh Freedom Fighters to India in the name of improving relations with India. Within 2 months, India crushed the Khalistan movement, however, Sikhs residing outside India are still fighting for their right to freedom. 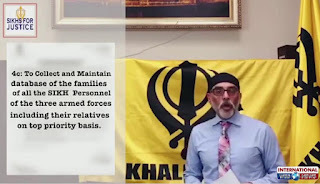 Hindu India might have devised the policy to win the hearts of Sikhs after crushing the Khalistan movement; Sikhs only wanted their rights as guaranteed by the Indian Constitution. However, the behavior of Extremist Hindus got ruder which once again revived the Khalistan movement. 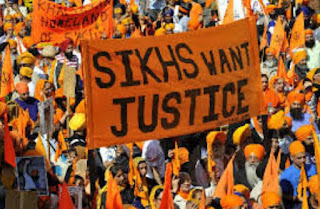 In their terrorism, Hindus could not realize that when Khalistan movement got its second birth and became strong enough that Sikhs living in West, declared 2020 as the year of Referendum for Khalistan. Now Hindu army and Brahman are restless. They got the biggest blow when Imran Khan invited ex-Cricketer and Provincial Minister of Indian Punjab Najwat Singh Sidhu to attend his oath-taking ceremony and General Qamar Javed Bajwa hugged him giving him the welcome gesture that Sikhs may visit Birth Place of Guru Nanak and other sacred places of Sikhs via Kartarpur Border without visas. This was welcomed by Sikhs all over the world. India was not ready for such a good gesture on the diplomatic and strategic level. Indian rejection of Pakistan's offer was equivalent to suicide for India. Hundreds of thousands of Sikhs came out to support the opening of the border at Kartarpur in such a way that they were holding Pakistani flags and chanting Long Live Pakistan. At last, Hindu India was forced to accept the Paksitan's offer. Hindu terrorist leaders have not come out of the sorrow that Indian Military Intelligence warned Indian Army Chief that from Soldiers to Generals of the Indian army, air force and navy may at anytime start treason against India.